Telluride Outside offers guided fly fishing packages on one of the most beautiful, sacred fly fishing destinations - The Lower Dolores. Book your unique guided trip today! Southwest Colorado fly shop, fly fishing guide service, family whitewater rafting trips, kayak trips, & photo tours! 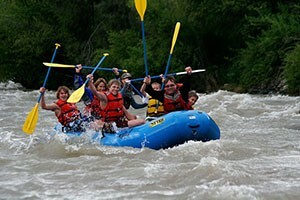 The best of Southwest Colorado adventure trips! The Dolores River is well-known for its challenging conditions and big fish. The 12-mile section under the McPhee Reservoir is an ideal stretch for avid anglers. Upper sections can be harsh in winter, but lower areas can be fished year-round. The Dolores River was on its way to becoming one of the better known trout streams in the West when severe drought struck in 1988. Other factors continued the decline in trout population, but there has been resurgence in the last decade and the Dolores now holds a reputation for stubborn and strong trout. The high-desert terrain surrounding the river is still wild, and part of the adventure here is finding a great section to share with the deer, turkey, and eagles. The river can be fished year-round but upstream sections freeze over and spring runoff turns the water deep red and rapid. The late-summer and fall seasons present ideal conditions. Lightweight waders will help you reach the ideal spots. The river is generally not too fast or deep past the damn. The most reputable stretch of river is the 12-mile section below the McPhee Reservoir. Head south on CO-145 from Telluride to Dolores. Turn right at CO-184 and then again on US-491. Turn right at CO-RD Ee, left at Co Rd 16, and right at Co Rd 28, which follows the Dolores back toward McPhee Reservoir. Other sections above the reservoir are more like the San Miguel. Look for spots off of CO-145.